Thiruvanathpuram, February 10 2015: Manipur, on the 10th day of the 35th National Games 2015 today collected four gold, one Silver and three bronzes in the events of Football, Fencing, Triathlon, Canoeing and Kayaking. Manipur women football team beat defending champion Odisha by 4-2 goals in tie breaker today at Corporation Stadium at Thrissur and clinched the gold. In the first half, Odisha led a goal against Manipur and then Manipur equalised the goal by a shot of Ngangom Bala Devi. The match failed to produce any goal in the second half and extra times. Goalkeepers : E.Panthoi Chanu, O.Roshini Devi, L.Ronibala Chanu. Defenders : A.Romi Devi, G.Radharani Devi, Th.Umapati Devi, L.Madhabi, O.Roshi Devi, H.Bijaya Devi. Ngoubi Devi, O.Bembem Devi (Captain), Y.Premi Devi, Y.Chandrajini Devi, M.Mandakini Devi, K.Keinakumari Devi. Bala Devi, Dangmei Grace, S.Rinaroy Devi, W.Komlapati Devi. 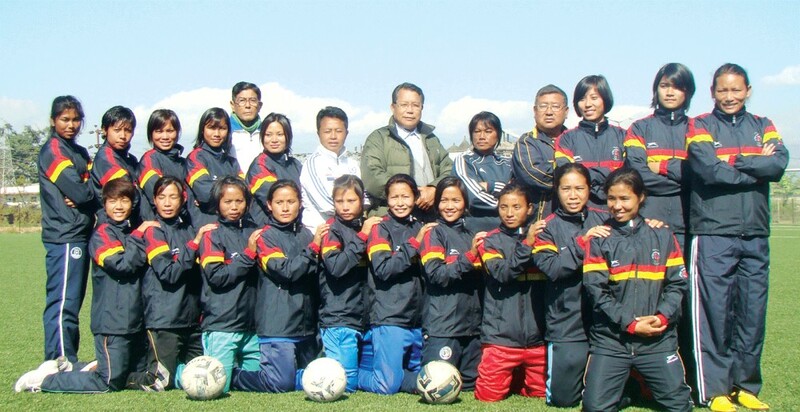 Officials : L.Chaoba Devi (Coach), S.Manitombi Devi (Assistant Coach), H Romita Devi (Physio), K.Biren Singh (Manager), L.Jyotirmoy (Official). In Fencing Mens EPEE event, Sagolsem Jayanta Singh of Manipur bagged the gold, Haryana's Sandip Kumar went to Silver and Delhi's Premananda Mutum and Maharastra's Ajinkya Dudhare settled in Bronze. In Fencing Women Foil event, Wahengbam Roji Devi of Manipur secured the gold and Maibam Usharani Devi of Manipur got the Bronze. In Triathlon held at Vellayani Lake for swimming, Vellayani to Vazhamuttom in National Highway Bypass at Thiruvananthapuram for cycling and race; Lourembam Mahesh Singh, Elangbam Sushil Singh, Mayengbam Chanu Linthoingambi and Chingakham Rani Devi of Manipur bagged the gold medal in Triathlon Mixed event. Gujarat and Maharashtra settled in Silver and Bronze respectively. In Canoeing and Kayaking held at Vembanad Lake at Alappuzha; Arambam Gyananjit Singh bagged Silver medal in 500m Mens Single Kayaking event and Khwairakpam Indira Devi of Manipur finished the third in 1000m Women Single Canoeing event and got the bronze medal. Salam Sunil Singh and Oinam Rakesh Singh of Manipur also finished the third in 1000m Men's Double Canoeing event and got the bronze medal. In the medal tally, Manipur ranked at the 7th position with Gold-13, Silver-11 and Bronze-13 . In boxing today, E.Memthoi Devi of Manipur beat Heena Tokas of Delhi by 27-22 points in Middle 75 kg women event. H.Chaoba Devi of Manipur beat Sarika Kumari of Jharkhand by 13-10 points in Light 60 kg women event. .LBishorjit of Manipur was lost to S.Sai of Telangana by 10-12 points in Welter 69 kg Men event. Jeevan Singh of Manipur was lost to Vishwanath Naik of Goa by 13-16 points in Bantam 56 kg Men event.